We’re pleased to announce that Renato After Alba received a Bronze Medal given by the Independent Publisher Book Awards for excellence in Literary Fiction. This is the 20th year that “IPPYS” have been been given.In addition to the Independent Publisher Book Awards, Renato After Alba is also the Winner of the 2017 Independent Press Award for Books on Grief. Both the author and his publisher, McPherson & Co. are honored by the awards. 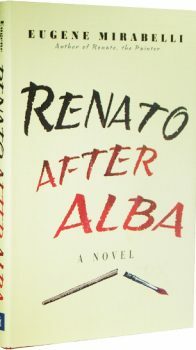 The distinguished Library Journal, has given Renato After Alba a starred review, raising it above other books under review. Hilary Daninhirsch, writing in Foreward Reviews says, The prose is sparkling, and Renato is a lively narrator. He yells, he cries, he swears, he grieves, and although his spirits have plummeted, he gets up every day, mingling with a colorful set of friends and family, trying to make sense of his new, unwanted reality. Despite Renato’s rage at his attaining the unhappy status of widower, the reader senses his feistiness and suspects that the book will, if not end happily, at least conclude with Renato’s somewhat triumphant re-emergence back into life, albeit on an uncharted path. For a book focusing on the effects of grief, it is unexpectedly uplifting, most likely because Renato is an utterly charming and empathetic protagonist. Renato After Alba is the astonishing sequel to the prize-winning book Renato, the Painter. Although it follows the earlier story, it is a stand-alone novel which can be read independently of the earlier work. Renato is an all too human, generous, loving (all too loving) flawed man, a painter with a first-rate talent and a second-rate career, “an artist who paints landscapes as if they were nudes, and nudes as if they were landscapes,” yes, that Renato, the family man whose wife, the beautiful Alba, has brought up not only their two children, but also the child he fathered out of wedlock, that same Renato who finally brought together his children, their mothers, his friends, his paintings, his everything, is now — ten years later — demolished by the unexpected death of his wife. A man of fragments but still an artist, he assembles a collage of scenes of life with and without Alba, recollections of his eccentric Sicilian-American family, encounters with well-meaning friends, daily attempts at resuming his former life, and metaphysical railings against any deity capable of destroying what it has created. In Renato After Alba, the deepest sorrow is not merely lacerating, outrageous, heart-rending, and tragic, but also, for someone so completely human as the enduring Renato, touchingly comic. You can read the first twenty-five pages of Renato After Alba by clicking on this sentence. Robert Gray, writing in Shelf Awareness — an essential journal for critics and booksellers — had this to say: “When I read Mirabelli’s two novels back to back not long ago, I was struck by how intricately, and intimately, woven together they were, despite being in many ways quite different reads. Renato, the Painter‘s narrator is a 70-year-old scoundrel of an artist, still hungry for fame and not particularly averse to temptation. In the sequel, Renato is 12 years older and trying to reorient himself after the loss of his beloved wife, Alba, a striking presence in the first book and a stunning absence in the second. 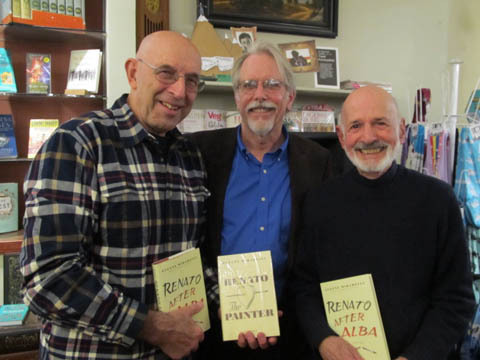 The borderline between these two novels is life and death.” — Robert Gray’s entire article about a reading MIrabelli gave at the launch of Renato After Alba is available at Shelf Awareness. It’s an interesting and enjoyable read. Give it a look. “Deeply moving, Renato After Alba is a grief novel that is never depressing. Readers will discover not only solace for being human but also joy for being alive. Alba remains an extraordinary absent presence, fully realized. Another character, a young woman who has lost her husband to brain cancer, has tattooed on her arm the words, ‘If love could have saved you, you would have lived forever’ — words that could be the epigraph to this memorable novel.” — Jeffrey Berman, author of Writing Widowhood: The Landscapes of Bereavement. “This novel reflects accurately and beautifully the thoughts and emotions that one experiences after the loss of a spouse.” —Gwen Romagnoli, author of Learning to be a Widow.